A wooden house may not be everyone's first idea of modern living but this simple yet stylish cabin is absolutely amazing, with the attention to detail of exposed wooden panels being the main design feature of the home's exterior and interior. This example of charm and classic architecture makes this living space a true joy. The idea of living in a wooden home is not new. In fact, it is one of the oldest methods of building a house but with the beautiful and elegant designs available today in prefabricated yet low cost options, homes such as this are no longer without the basic amenities that we are all so used to. They can be fitted to meet whatever your requirements are. Just have a look at these designer houses by Kuloğlu Orman Ürünleri for inspiration. This natural exposed wooden home has the best of both worlds, simple living and modern elements. Wooden design and architecture that makes this house so warm and inviting, allowing it to look and field almost like a rustic cabin, but with an edgy twist. The home has enough windows located all around, allowing for natural sunlight and fresh air to enter each and every part of the home, while making the living space comfortable too. This home is open and inviting and is actually quite a bit larger than what it appears to be from the outside, with high ceilings and open plan living spaces making it a relaxing get away from the city to be one with nature and enjoy the landscape on your own terms. 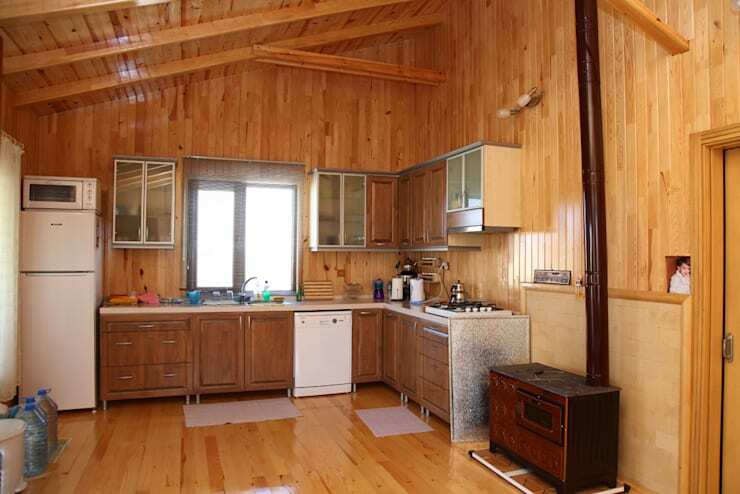 As we enter into the living room of this unique cabin we get a sense of the grand yet country living style that is synonymous with being in a wooden home such as this. The ample natural sunlight that streams in through the windows allows the space to be brightly illuminated throughout the day, while the exposed wooden elements creates a comfortable open plan space. The large L-shaped sofa provides an adequate use of the seating area in the home, taking full advantage of the corner, while the blue and grey tone used in decorating this space is contrasting to the rest of the wooden elements displayed in the room. The adorable rug included in the living space adds a relaxing yet comfortable aspect which makes the space come together very well. A rustic kitchen with modern functions such as this will make life completely comfortable and yet relaxing regardless of any social occasion. The wooden elements of the actual structure are perfectly complemented by the wooden elements of the kitchen cabinets. With adequate storage areas for supplies, crockery and modern appliances. The kitchen takes up the other half of the open plan living space that was the living room, but makes the whole area totally perfect, with the inclusion of a wood burning oven too for those very cold days, warming the entire cabin up quite efficiently. 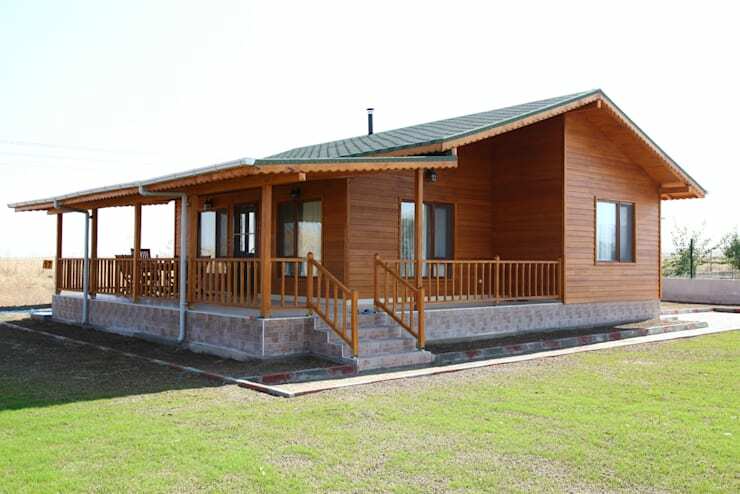 This modern cabin allows the occupants to enjoy the sights of nature, while having access to modern living at its best! 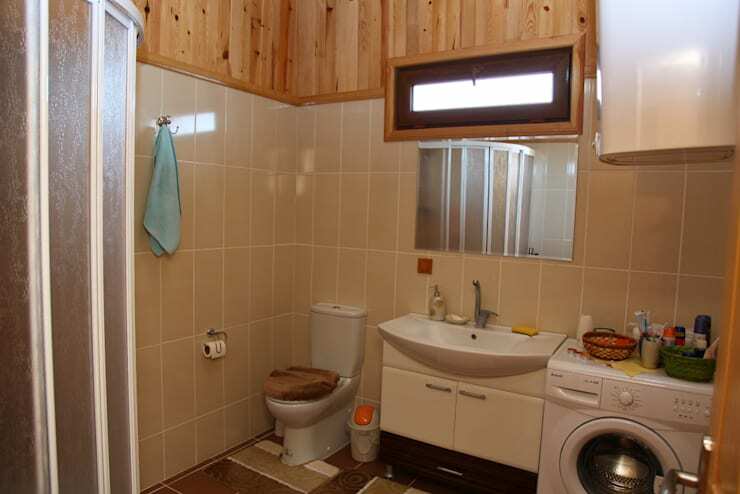 Who would've thought that this cabin had enough space for a bathroom? Let alone a decent modern bathroom such as this with a washing machine for those extended stays? Exposed wood as is used in this home has many functions and can be treated to be resistant against water and even fire, the low maintenance building element allows for a higher strength, sometimes even more so than concrete! And with the numerous benefits of exposed wood creating an inexpensive option for building a home of the most unique yet rustic designs, this may be the option of the future when it comes to making a decision on a house. 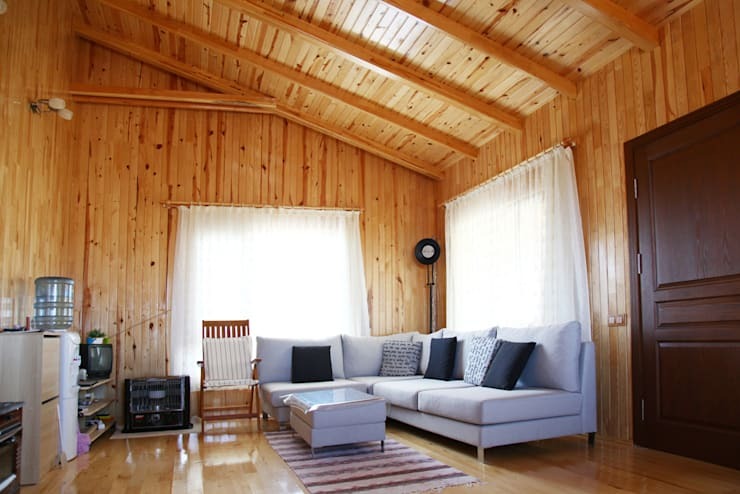 Think about the sheer quality and standard of a wooden cabin as a home for a moment. 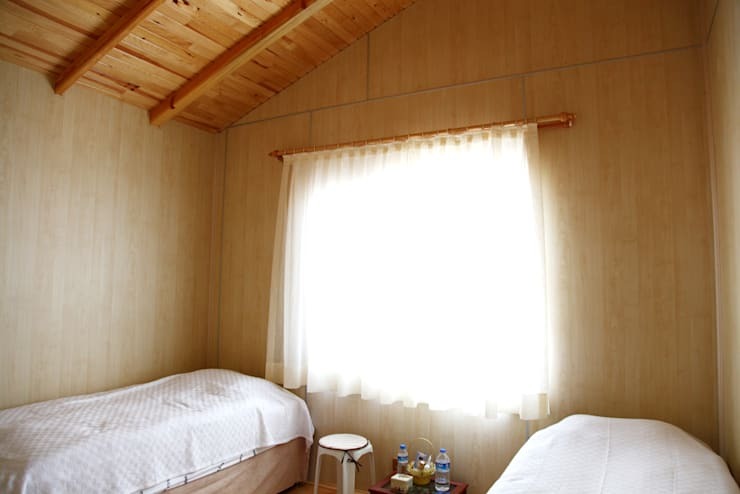 This adorable bedroom is simple and uncluttered with very little extra added functions included, this cabin is more a vacation spot away from the busy working world, but allows the occupant to remain in touch with modern living in a minimalist manner. Although living here on the odd occasion may not be a total grand holiday, it is the perfect way to enjoy the finer things in life… family, friends and of course fresh air. This bedroom is well ventilated and the natural sunlight adds a warming yet comforting effect to the living space, making it an elegant and well presented sleeping area within the cabin. The limited storage space of the home means that it is a space for the bare minimum and only essentials should be brought along. That's not too bad if you can pack one bag of all the goods you will need for a weekend. Enjoying this home from the porch may be the best thing to do, allowing you to take in the beauty and classical elements of the surrounding environment and nature without stepping away from the comforts of the modern world. 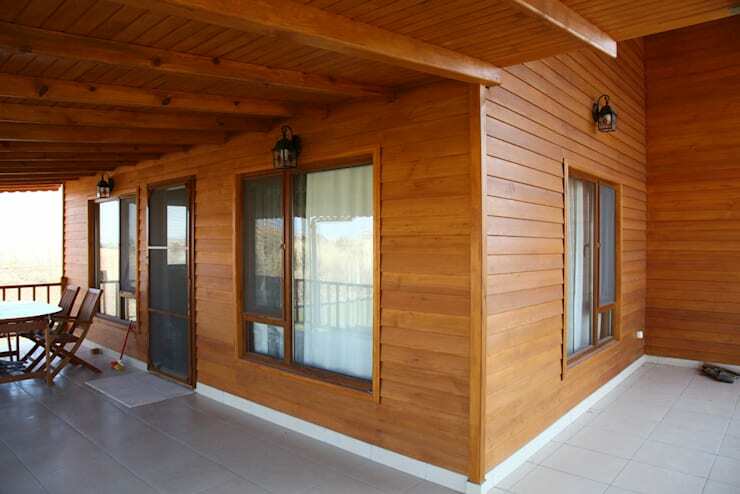 This porch of this stunning cabin has been perfectly designed with a floor tile adding to the charm of the space, creating a relaxing yet well designed area to sit back and soak up the sun. The exterior area of this home is low maintenance too allowing it to be enjoyed regardless of the season. This home is sure to get you loving nature even if you are a creature of comfort. If you liked this wooden home, you might also enjoy: The House that Performs Wonders with Wood. Could you live in this wooden home? What did you like about it? Let us know!